This, the third volume in this excellent trilogy, follows the main protagonist through the period of King Edward vs William Wallace and through the events leading up to the dissolution of the Templars. King Philippe of France has a plan to fill out his coffers by seizing all of the French Templar properties and treasure; an insidious plan brought forth by his insidious adviser, the chief lawyer, Nogaret. 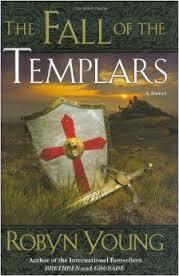 Front and center in all of this action and intrigue is Will Campbell, the Templar Knight and main character in the series. In a lot of the historical fiction that I read, the history of the events portrayed are well known and therefore you know how it ends before you start reading. The way the author crafts the story to meet the historical end is what captures my interest. The author did her job and has crafted a wonderful tale that accomplished that goal. The integration of the fictional Campbell into the fabric of these events had me thinking that, yes, things could have happened in the manner written. The story is full of the duplicitous nature of kings and the ruthlessness they employ to achieve their ends. The characters are larger than life, from the hair shirt wearing Philippe, the Scottish rebel William Wallace, the evil incarnate Nogaret and most especially William Campbell. I hesitate to give anything away plot wise so suffice to say William Campbell goes through a multitude of trials and tribulations, some good but some not so good. I highly recommend not only this volume but the whole Brethren series. 4 stars. To quote the eminent philosopher and all around wise man, Homer Simpson, “I like stories.” I especially like good stories and this series by Glyn Iliffe is magnificent. The Oracles of Troy is the 4th book in this engaging tale of Odysseus and his fictional captain, Eperitus and the ten year war between the Greeks and the Trojans. The war is basically a stalemate in this tenth year and the Greeks are losing heart and long for their homeland; a homeland that is becoming increasingly more chaotic without the kings and leaders there to govern. This is especially true in the kingdom of Ithaca where Odysseus’ wife Penelope is barely keeping a group of ambitious nobles from taking the reins away from the rightful ruling family. Enter the three oracles, the pieces needed for a Greek victory and the tale of how Odysseus and companions go about to fulfill the three conditions given by the gods. The author, not only in this book but in the whole series, does for the myths and stories of Odysseus in the same manner that Mary Renault does for Theseus in The King Must Die, etc, though in this case the supernatural intervention of the gods, in particular Athena is much in evidence. 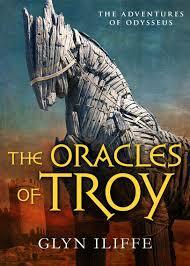 Mr. Iliffe does a masterful job of humanizing the Homeric heroes while allowing the gods to have their place as well. These mythic, larger than life characters are portrayed with all of their doubts, worries, ambitions and faults. We have a tale not only of the glory and honor of battle and war but the human failings of betrayal and greed; the human feelings of love and desire. This is a wonderful telling of a wonderful tale. 5 stars and a hearty Hoover Book Review recommendation. Typically I look forward to the new releases from Gordon Doherty as he has been a favorite of mine for a few years now. Also typically, I race through the new release in the utter delight of being unable to put the book down. Finally, typically, I am devastated when I finish the book because now I have to wait for the next one. 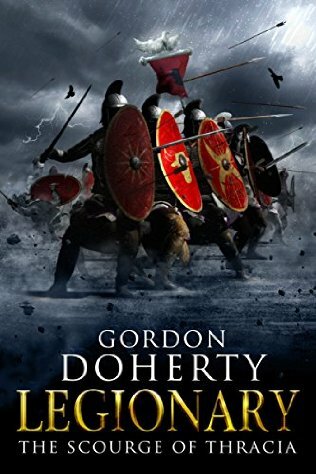 These three typical characterizations were in full force while reading the fourth installment of the Legionary series. In this edition, the XI Claudia, or what is left of them after book three, is given the task of rebuilding the Legion while defending a strategic mountain pass against the Gothic horde led by Fritigern. Unknown to the Romans, one of the Goth’s leaders, a very, very nasty specimen, has recruited a troop of Huns and this has a devastating impact on the Roman forces. While all this is going on, the author gives us more insights into the minds of Pavo and even more so the mind of Tribune Gallus. These two main characters have been through a lot and Mr. Doherty does a superb job in allowing the reader see them wrestling with their troubled minds and souls. One more typical feature of any of the author’s books is his penchant for intricate and intriguing plot twists…and boy, are there ever some of those in this book. Be forewarned…there is stuff happening that will make you glad book five is in the works. 5 stars and a hearty Hoover Book Reviews recommendation.